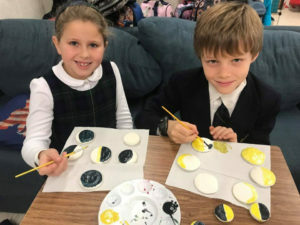 Ms. Ernest and her class of shining stars took inspiration from their reading of The Moon Seems to Change by Franklyn M. Branley to paint the many appearances of the moon. 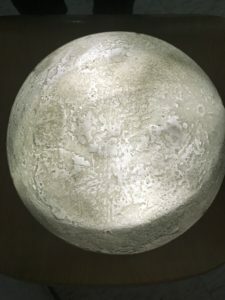 What different shapes and colors can the moon be? 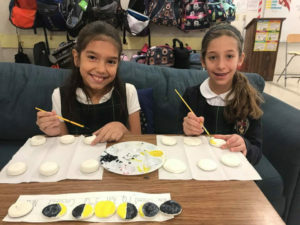 Using diagrams of the sun, moon, and earth, the children discovered the eight phases of the moon and the conditions that exist for each: new moon, waxing crescent, first quarter, waxing gibbous, full moon, waning gibbous, third quarter, and waning crescent. 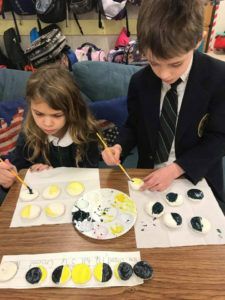 With paints and molds, students created little moons to show the changes that happen throughout a month. Afterward, Ms. Ernest dimmed the lights so the classroom moon could appear.